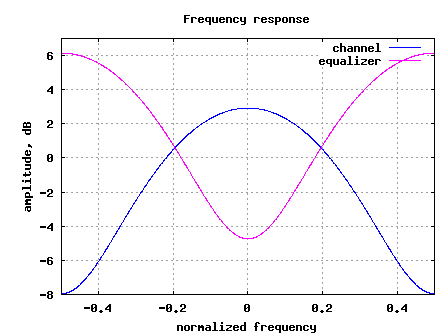 Though the total channel is a frequency selective channel, the channel experienced by each subcarrier in an OFDM system is a flat fading channel with each subcarrier experiencing independent Rayleigh fading. 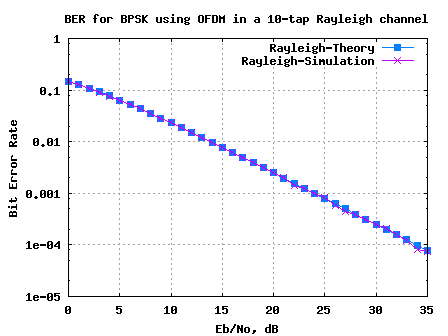 So, assuming that the number of taps in the channel is lower than the cyclic prefix duration (which ensures that there is no inter symbol interference), the BER for BPSK with OFDM in a Rayleigh fading channel should be same as the result obtained for BER for BPSK in Rayleigh fading channel. Let us try to define a quick simulation to confirm the claim. Let us use an OFDM system loosely based on IEEE 802.11a specifications. You may refer to post Understanding an OFDM Transmission  and the post BPSK BER with OFDM modulation  for getting a better understanding of the above mentioned parameters. is the channel coefficient of the 2nd tap and so on. The real and imaginary part of each tap is an independent Gaussian random variable with mean 0 and variance 1/2. The term is for normalizing the average channel power over multiple channel realizations to 1. In the post on Cyclic Prefix in OFDM , we discussed the need for cyclic prefix and how it plays the role of a buffer region where delayed information from the previous symbols can get stored. Further, since addition of sinusoidal with a delayed version of the sinusoidal does not change the frequency of the sinusoidal (affects only the amplitude and phase), the orthogonality across subcarriers is not lost even in presence of multipath. 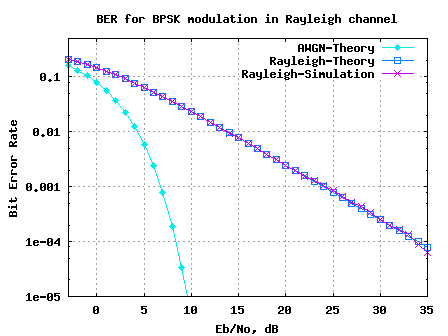 Since the defined cyclic prefix duration is 0.8us duration (16 samples at 20MHz), the Rayleigh channel is chosen to be of duration 0.5us (10 taps). I recall reading that Fourier transform of a Gaussian random variable is still has a Gaussian distribution. So, I am expecting that the frequency response of a complex Gaussian random variable (a.k.a Rayleigh fading channel) will be still be independent complex Gaussian random variable over all the frequencies. I will update the post, once I am able to locate the proof for “frequency response of a complex Gaussian random variable is also complex Gaussian (and is independent with frequency)“. Given so, the bit error error probability which we have derived for BER for BPSK in Rayleigh channel  holds good even in the case of OFDM. (d) Convolving each OFDM symbol with a 10-tap Rayleigh fading channel. The fading on each symbol is independent. The frequency response of fading channel on each symbol is computed and stored. The simulation results are as shown in the plot below. 1. The simulated BER results are in good agreement with the theoretical BER results. 2. Need to find the proof for frequency response of a complex Gaussian random variable is also complex Gaussian (and is independent with frequency). Hope this helps. Happy learning. Please click here to SUBSCRIBE  to newsletter and download the FREE e-Book on probability of error in AWGN. Thanks for visiting! Happy learning. Copyright © 2007-2012 dspLog.com. All rights reserved. This article may not be reused in any fashion without written permission from http://www.dspLog.com.